VIN decoders play a key role in checking a VIN or identifying the history of a used vehicle, so it’s easy to confuse their functionality with that of a VIN check tool or vehicle history reporting service. In this post, we've clarified some of the major areas of confusion between the three services by detailing their core functionalities. The primary function of a VIN decoder, just as it’s named, is to decode or extract information from 17 digit VIN numbers (standardized by the NHTSA in 1981). Each VIN number is unique to one vehicle, with positions 12-17 reserved for the vehicle's serial number to avoid duplicate VINs. Positions 1-11, with the exception of position 9, are used to describe basic vehicle details including year, make, model, body and drive type, engine, manufacturing country and plant, and sometimes transmission. Position 9 is used to determine the validity of the VIN, which you can learn more about here. Many automotive businesses implement a VIN decoding solution via web service, as it can be the easiest and most accurate way to identify vehicles. Other companies work off of a delivered flat file that is updated nightly. While these 17 digits identify many aspects of the vehicle, there is still a significant amount of extended vehicle data or 3rd party validation data to be obtained, such as installed and optional equipment, EPA MPG and green score ratings, vehicle weights and measurements, and etc. To access this additional vehicle data, a complete vehicle data and VIN decoding solution may be needed. Though a VIN decoding solution can provide all the vehicle details you need to know at the time of production, any post production vehicle history details call for a separate service, such as a VIN check or Vehicle History Report. The level of vehicle information provided by a VIN check tool varies quite a bit. Though many of them are advertised as free, which is true for a portion of data, accessing a full vehicle history report (discussed later in this article) almost always has a cost associated. What information do VIN check tools provide? First and foremost, a VIN check tool should identify whether the VIN number record exists. The majority of free VIN check tools will also offer a handful of vehicle details, typically the vehicle’s year, make, model, trim, and body type (sedan, SUV, etc.) which are all identified using the VIN decoder functionality of the VIN check tool. Where VIN check tools tend to differ from each other is in the level of vehicle history information that they are willing to provide before requiring the user to purchase a full vehicle history report. Websites such as vincheckup.com, faxvin.com, and vincheck.report simply verify the vehicle and provide basic vehicle details. Any additional information about the specifications or history of the vehicle must be purchased in the full report. 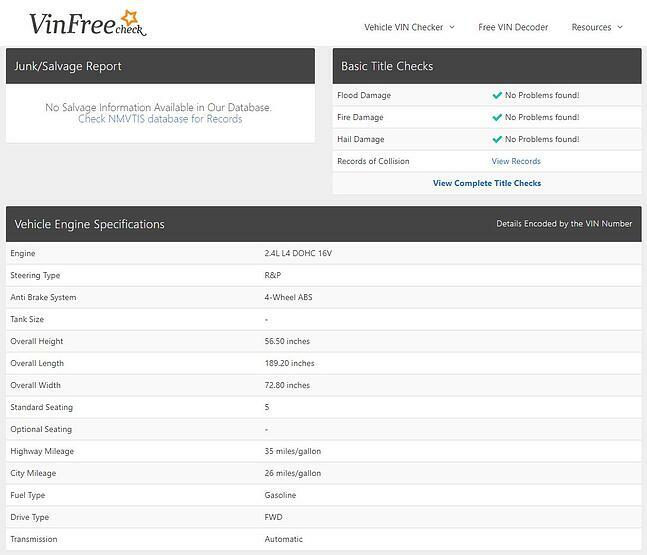 Some of the more advanced VIN check tools, like vinfreecheck.com and vehiclehistory.com, will include some additional vehicle specifications and vehicle history information for free. The National Insurance Crime Bureau's (NICB) VIN checker, though much different from the typical VIN check tool, is a valuable and highly accurate resource worth mentioning. 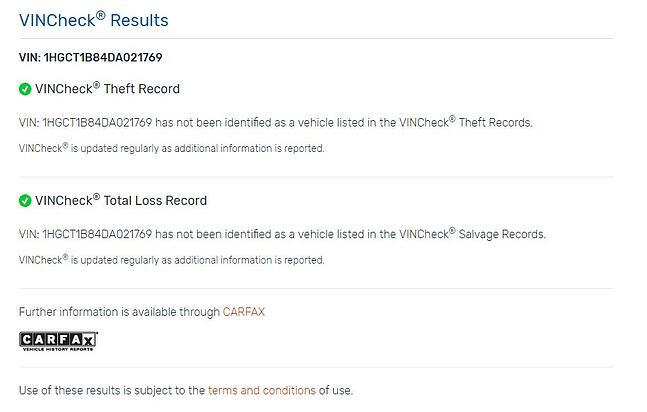 NICB's VIN checker solely identifies whether the vehicle has been listed in their theft records or salvage records. 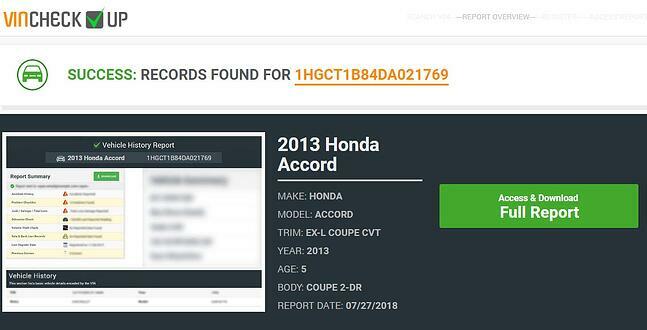 For consumers or businesses looking to obtain more detailed data on the history of a pre-owned vehicle, websites such as CARFAX, AutoCheck, and instaVIN all offer a great vehicle history reporting service. Used vehicle history report data is very important for consumers in-market to purchase a pre-owned vehicle, insurance companies determining vehicle risk, auto mechanics identifying past service and repair records, and the list goes on. This information cannot be obtained simply by decoding a VIN. However, a VIN decoder is almost always paired to an extensive database containing service records to facilitate vehicle history reporting. You may be wondering which type of vehicle history data is included in these reports and where they aggregate the data. Though each pre-owned vehicle history reporting company has its own flavor, you can anticipate getting much of the same core data from each service. Total loss: Some insurance companies may claim a damaged vehicle as a total loss, even if it hasn't earned a salvaged title. Odometer readings: As a vehicle shopper, mileage is a very important piece of the purchase decision. Vehicle history reports will often provide tracked odometer reading history. This is a simple way to identify odometer rollbacks. Lemon history: If a new vehicle has been branded a lemon due to substantial defects, this brand sticks with the vehicle at any point it's resold as used. Accident information: This information may include structural or frame damage, the deploying of airbags, other minor accidents that were not determined to be a total loss or salvaged. Service and repair information: The history of routine maintenance and repairs is a great indicator of the vehicles life expectancy. This is valuable information for buyers, sellers, insurers, and extended warranty suppliers. Most of the above data is aggregated from state DMVs, Police and Fire Records, Insurance Records, and businesses that service/repair vehicles. The National Motor Vehicle Title Information System (NMVTIS) is a great resource for title information, being the only vehicle history database in the nation that requires by law that all states, insurance carriers, junk/salvage yards report their data. VIN Check systems and full vehicle history reports generally include basic vehicle identification data obtained from a VIN decoding service. However, these are just two of the many business applications that utilize VIN decoders. They are also frequently used to help manage new and used vehicle inventory, track down vehicle specs for transport logistics, and to identify installed standard and optional equipment for accurate insurance quoting and OEM compliant vehicle marketing -- to name a few more. If you're interested in learning more details about VIN decoding, be sure to download our white paper "Decoding the VIN."